Since Belem, we have indeed traveled deeper into the rainforest. Firstly to Manaus. I knew before we even left London that Manaus was a city of nearly 2 million people and that it comes with all the trappings and shortcomings of a city its size. However, in my head, I still liked to romanticise this outpost in the jungle to be a small colonial town, opera house, rubber baron mansions and picturesque townhouses. I envisaged a place where the urban and the jungle met and where a short walk from a city cafe would find one amongst the palms and vines of the rainforest. This fairytale could never be supported, but how wrong was I? Our plane landed in darkness to a city in a sea of black, tall buildings all lit up, a bridge over an inlet perfectly illuminated and vein-like roads stretching out into the rainforest. It was still a shock just to see for myself how vast this city was. In daylight, the city didn’t fulfill it’s neon promises of the night. The opera house was impressive, but less so than Belem’s. The market was less vibrant and more functional and the docks more of a inner-city ferry terminal than the gateway to the world’s largest river system. But then I suspect that’s just it, this town is little more than a one or two day stopover for those looking to get in to the Amazon. After our obliguatory stopover, we headed off, by car, boat, mini-bus and canoe, to our jungle outpost and home for the next four days. As we drove through the forest after crossing the mighty Amazon, it was easy to see the effect roads have had. All along the road the tree line seemed to be retreating. Huge swaths have been cleared. We saw the cows that had replaced the trees, more poignantly, we saw their ribs and skeletal frames. It saddened me that people put these ill-suited creatures on this land instead of the perfectly adapted flora and fauna that had been there originally. As we got deeper in, the road became less Tarmac and more dirt, the cleared areas on each side grew smaller, though were growing still, some had just been cleared and were still smouldering. We arrived at another river, this one smaller than the Amazon proper, which mearly meant that a concrete bridge had been erected over it. Here we transferred to boats – motorised canoes this time, for the last legg of our journey. 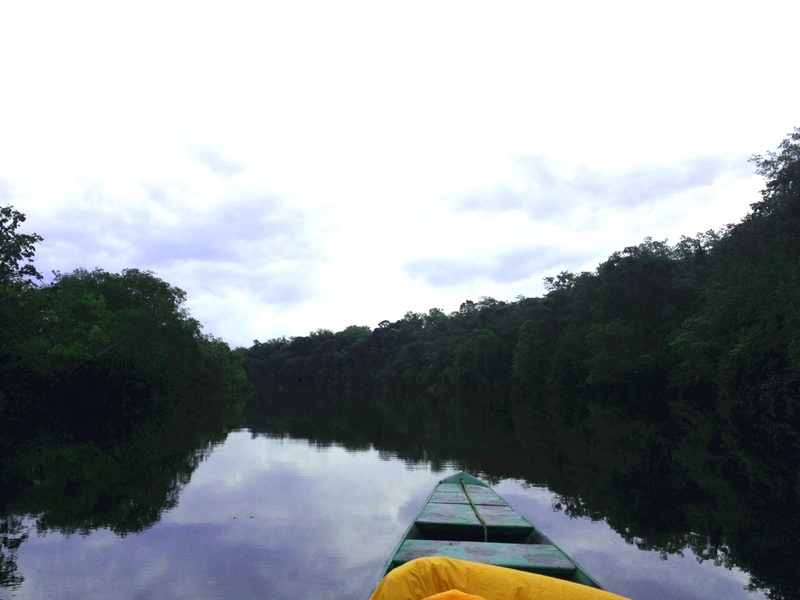 For 30 minutes we navigated up river and through flooded forests, each turn taking us deeper in to virgin rainforest until we arrived at a jetty, a wooden building on stilts and a palm leaf roof. We had arrived.